Yes! He is alive! Just as he said! He overcame the grave and he is alive! Put yourself in the place of these women. They were coming, hoping to properly embalm the Lord’s body, and they found the stone rolled away already. A stone which could not easily be rolled away. And where were the guards? The tomb had been sealed and guards placed outside. Where were they? Why did they leave their post? To leave an assigned post in those times would have been cause for the death of the soldiers. What had happened to cause this to happen? 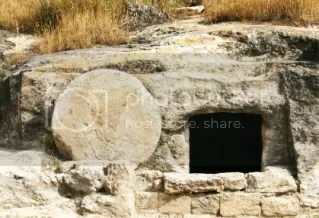 Matthew 28:2-4 tells us “2there was a violent earthquake, for an angel of the Lord came down from heaven and, going to the tomb, rolled back the stone and sat on it. 3His appearance was like lightning, and his clothes were white as snow. 4The guards were so afraid of him that they shook and became like dead men. Did they faint? It surely sounds like somehow these men passed out from what they saw! When word got back to the chief priests and elders, they told the guards to tell this story as they gave them a large sum of money to do so…. (Matthew 28:13-14) “You are to say, ‘His disciples came during the night and stole him away while we were asleep.’ 14If this report gets to the governor, we will satisfy him and keep you out of trouble.” This makes me laugh. If they were asleep, how would they know who took the body? If the governor were to find out that they were ALL asleep on the job, no matter what the chief priest say to him, these men are in big trouble. Admitting to sleeping on the job? All of them at the same time? They are still in big trouble. Let’s go back to the ladies who came to the tomb. Matthew tells us that the two ladies who came were Mary Magdalene and another Mary. Luke says there were more than two ladies at the tomb that morning. I don’t really think it matters how many were there, but ladies, isn’t it awesome to hear that WOMEN were the first ones to find out that the Lord had risen from the dead? These women ran back to the apostles to tell them what they had seen and heard. Have you ever been in a group of ladies who were so excited they were speaking so fast and probably didn’t make a lick of sense? I have a feeling that was what happened. Luke 24:11-12 11But they did not believe the women, because their words seemed to them like nonsense. 12Peter, however, got up and ran to the tomb. Bending over, he saw the strips of linen lying by themselves, and he went away, wondering to himself what had happened. Each of the four Gospels give different witness accounting of what had happened that Sunday morning, but they all concur on one thing. Jesus was alive. John 20: 10-18 10Then the disciples went back to their homes, 11but Mary stood outside the tomb crying. As she wept, she bent over to look into the tomb 12and saw two angels in white, seated where Jesus’ body had been, one at the head and the other at the foot. 13They asked her, “Woman, why are you crying?” “They have taken my Lord away,” she said, “and I don’t know where they have put him.” 14At this, she turned around and saw Jesus standing there, but she did not realize that it was Jesus. 15“Woman,” he said, “why are you crying? Who is it you are looking for?” Thinking he was the gardener, she said, “Sir, if you have carried him away, tell me where you have put him, and I will get him.” 16Jesus said to her, “Mary.” She turned toward him and cried out in Aramaic, “Rabboni!” (which means Teacher). Dear ones, we celebrate today because Jesus overcame the grave. It was written in the scriptures that he would be crucified, die and be buried, and rise again on the 3rd day. He was placed on the cross to take our place, to bear our sin, so that we would be sinless in the sight of God. It’s a free gift for you. The Lord died for you right where you are in this time. You don’t have to clean up anything. You don’t have to redeem yourself first to accept this gift. God loves you. It may be hard to believe with the sin we all bear, but he will never leave or forsake you. He wants you to be a part of his forever family. Put out your hands. Accept the free gift of His Son. Jesus didn’t die. He is alive today and will return for His people. Celebrate! He is Risen! He is Risen indeed!